You have probably heard about the summer slide – the way kids can lose a lot of the skills, knowledge and motivation they learned during the school year over the lazy, hazy days of summer. In fact, students who don’t participate in any summer enrichment or educational activities lose about 22 percent of knowledge and skills gained during the school year, according to the National Summer Learning Association. Teachers generally spend the first two months of school re-teaching material students have forgotten over the summer. 1. Ask for insight. Check with your child’s teacher before school gets out to see what kinds of educational goals she recommends for your child. Don’t compare your children’s academic performance to siblings or friends. Everyone learns and grows differently. Aim to support your child wherever he or she stands academically right now to maximize enjoyment of learning. 2. Hit the library. The library is a great, free resource. Check out books that interest your child. The librarian can offer many other book suggestions that match your child’s reading ability and interests. Join your local library’s summer reading program and arm your child with their very own library card. 3. Visit museums in your area. Find out in advance when there are free days at the local museums and learning centers. Opt for guided or non-guided tour, as your family prefers. Be sure to check out the gift shop on your way out for inspired games and toys. 4. Plant a garden together. Use illustrated gardening books by Sharon Lovejoy to find projects that suit the personalities of your family and kids. Involve the kids with planting seeds and watering the plants and flowers for a little science lesson in disguise. Arm them with a daily gardening journal where they can include their own pictures or observations. 5. Shop like a teacher. Visit your local teacher supply store and stock up on workbooks and educational games. Other things you will find that might motivate summer loungers include timers for breaking the day up into learning chunks, craft supplies for every age, and educational games, videos and music. 6. Let them plan a meal. The kids can become chefs for the day, including the jobs of finding the recipes, making the grocery list, cutting the coupons, doing the shopping, comparing brands, and cooking up a storm. Then, be a good sport and enjoy whatever they serve. Very young children can do the same, only with pretend food. 7. Have a word of the day. Put the word in large letters at the top of a page with the definition just below. Hang the word on the fridge and make a game out of using it in sentences all day long. 8. Think summer camp. Lots of local summer camps offer education-related opportunities (see our Camps & Activities Guide at AlaskaParent.com/guides). Learning is much more fun for kids when it’s intertwined with physical activities or games. They’re learning without even knowing it! 10. Keep a “How I Spent My Summer Scrapbook.” Choose a blank-page, over-sized book with ample pages for writing, collaging, collecting and embellishing. 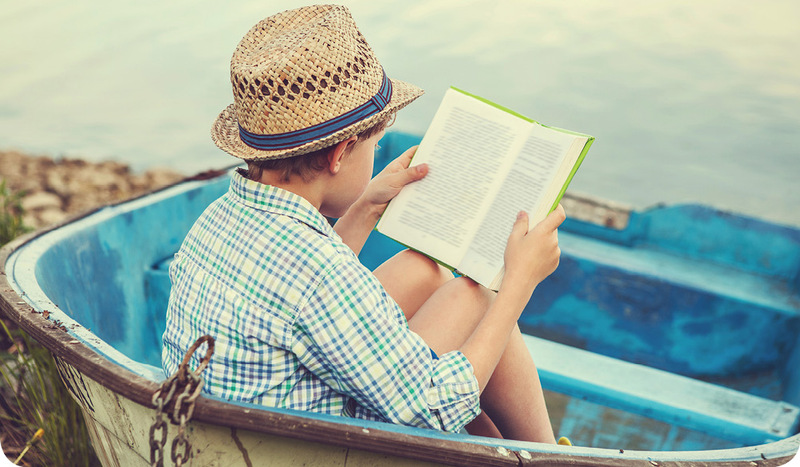 Set aside time to work on “summer books” for a half hour every day at whatever time of day works best. Let kids decide whether or not to keep it private or share the results with the family. 11. Sign up for BrainPop. This educational website has over 1,000 short animated movies for kids ages 6-17, making it the perfect substitute teacher for your kids over the summer. Best of all, they can pursue topics that interest them. Check with your child’s school library to see if they have free access to BrainPopJr for K – 3rd Grade. Otherwise a subscription is money well spent on entertaining enrichment. 12. Commit to a cause. If your child loves animals, see if you can spend some time volunteering at a local animal shelter. If she’s a regular fashionista, why not throw a summer “trashion” fashion show to raise money for a local charity? Even a trip to your local food bank or letting your kids come with you while you give blood is a life lesson that keeps on giving. 13. Share your childhood favorites. Did you love to make friendship bracelets or collect comic books? Did your husband learn to play guitar or practice scouting skills in the backyard? Summer is the perfect time to share your favorite hobbies and summer pastimes with your kids. Why not strike up a conversation about it at dinner tonight to get the memories rolling? 14. Explore Alaska. Summer in Alaska is filled with many great opportunities for exploration – from nature-filled adventures to fun, educational events. Check out the Out & About calendar and 101 Things to Do This Summer for lots of ideas!